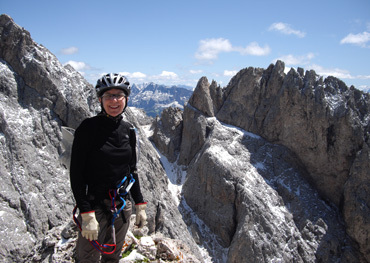 Being in the Dolomites area of the eastern Italian Alps is a time of both simple and exotic pleasures. Renting a ski apartment in the summer gifts us with simple pleasures like a break from our daily ritual of packing and unpacking; access to a clothes washing machine; the use of a tiny, equipped kitchen; frequently enjoying an afternoon cup of tea; and a nightly soak in a tub. Enjoying the peaks an hour up from our Selva apartment. The exotic pleasures come from grand mountain views always out our window; a ready network of maintained hiking trails; and being able to step out our door and in an hour's time have charged up a 2300' face with 4 distinct vegetation/terrain zones to arrive at a 360° panorama of stunning rocky peaks--and then have our picnic lunch. It doesn't get any better than this. But the thunderstorms that had dogged us on our approach to the Dolomites for the last 10 days had settled too comfortably into the mountain region. Rain and the threat of thunderstorms was a part of every day's forecast when we arrived so we had to re-script the sporting activities for our stay. Bill had been plotting Via Ferrata routes and hikes during our approach but being clipped onto a steel cable during a thunderstorm was a loser, so we stayed low for the first 10 days. The 2300' hike up to Stevia that we can do in just over an hour provided several day's entertainment and the much-needed hiking-specific conditioning for my legs. 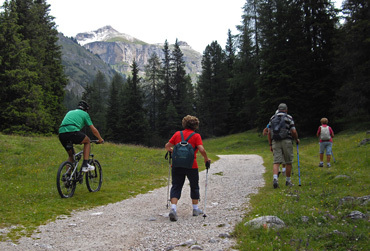 Having the choice of a 1 or 2 hour route for our descent added some interest as did taking other trails from Selva. Access to a swimming pool and a ping-pong table promised good rehab activities for my injured shoulder and a change of pace if the foul weather became too burdensome. Our relationship with the Dolomites must be stuck in the infatuation stage as Bill again said "I'm having a great day" while we were sheltering from the day's latest downpour under the leaky canopy of a conifer. And that was after descending about 1500' as quickly as we could because a lightning storm had let-loose directly overhead at the highest, most exposed point of our hike. He was grinning and we chattered away as indeed, it had been a grand day. It had been another exhilarating day of vigorous exercise getting us to stunning settings and that glow overpowered any issue with the rain. Selva, like all of the nearby mountain resort villages, doesn't take its customer loyalty for granted and this year the municipality had added free group activities for participating hotel/apartment guests. The only activity of the dozen listed that caught our eye was the Street Stepper--a variant on a bicycle. 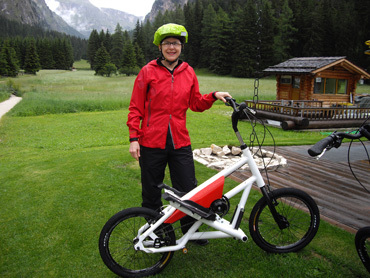 Barb & the Street Stepper made it to Vallunga in the rain. The Street Stepper entry looked like the perfect rainy-activity so we checked the forecast and signed up for it on the wettest of our first 5 days in Selva. We were disappointed to later learn that the policy of the Selva tourist office was to cancel the "Street Stepper" if it rained. Luckily for us the instructor was 'webbed footed' like Oregonians pride themselves in being and our 2 hour introductory class was 'on' with him despite the rain and his lack of appropriate clothing. The other registrants cancelled because of the wet stuff so all the better--we had a private session. Our introduction to these new contraptions was more of a trial-by-fire experience than I had envisioned. 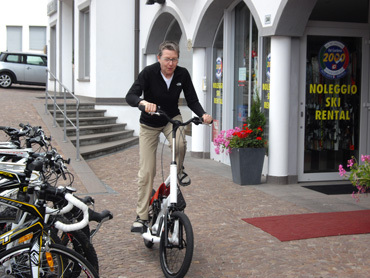 I'd hoped that we'd get acquainted with the bike-like-thing on a nice wide-open, flat parking lot after our 2 minute experience in front of the sales shop on a drier day. But no, this was the typical 'go-for-it' mountain guide approach and after a once-through on the operating instructions in which we filled in the missing English vocabulary like "brakes" and "speeds," we headed off down a narrow cobbled sidewalk in the main street shopping district in yet another downpour. My simmering anxiety shot through the roof as I had to navigate window-shopping pedestrians on one side and the curb and fast traffic on the other side--all while my still-injured shoulder was shrieking at the thought of getting hurt if I bungled it. Just standing on the Street Stepper was tense the first time. I probably sweated more from the anxiety than the physical effort in our designated 2 hour session that was a bit more than an hour on the bike. The fret and stress came from the newness of the whole thing and having to learn at someone else's tempo rather than my own. 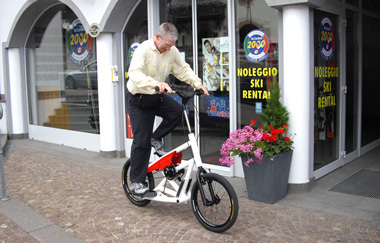 The Street Stepper is a stand-up bicycle that is propelled by a stepping motion like that of a stair-stepper fitness machine rather than by pedaling. It has 3 speeds, a pair of brakes, and doesn't roll backwards. Part of the awkwardness of it is the widenss of the foot platforms--the ingrained patterns from getting on and off a bicycle are quite wrong for this set of wheels. Getting organized to stop was more trying for me than getting going, which added to the stress and uncertainty. However, the Street Stepper was surprisingly forgiving. Like a bike, it coasted nicely so I didn't have to step continuously to keep moving. And unlike bike pedals, the foot platforms functioned independently so if it was compelling to only step with one foot for a few strokes, it readily obliged. Stepping with only one foot allowed me to regulate the speed easily without resorting to using the brakes. And though I couldn't always provide the power it needed to go uphill on the gritty foot paths, it was reassuringly stable and responsive on wet and rough surfaces, both going up and down. Bill getting under way for a 1 minute trial spin. The Street Steppers seemed to be more of a new gimmick than an innovation that fills a significant niche. Going uphill is much harder than on a bicycle though Bill said that a lower handlebar position would recruit some helpful upper body power into the effort. And what's the good of going faster than walking speed if there is no where to put the groceries other than on your back? Those criticisms aside, it could be just the solution for someone whose back or bottom can't tolerate a bicycle or who needs a different type of motion for rehabilitating from an injury. For me the free outing on the Street Stepper was a chance to once again push the edge of my fear out as it seems that if I don't push-back against fear of doing new things that it will slowly confine me. The Street Steppers were a fun novelty for 2009 but everybody's enduring favorite, Vallunga on the edge of Selva, drew us out a number of times on the questionable weather days. Vallunga literally has something for everyone. The sign pointing the way to Vallunga was minutes from our door. For the high elevation folks, it can be the starting point for the intermediate-difficulty "Pertini" Via Ferrata that we've done twice or the launching point for multi-day, hut-to-hut hikes around the peaks. Robust day-hikers can challenge themselves with one of the several routes that veer-off the sides of the valley's steep slopes. 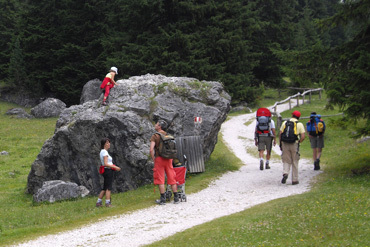 And groups congregate in Vallunga for introductory sessions in activities such as Nordic Walking and rock climbing. We also used the moderate steepness of this long, glacier-carved valley for 2 hour out-and-back fitness walks in which we could accumulate over 1000' of heart-pounding elevation gain in an hour. And true to its name, one can walk even farther up this long valley before taking to the sustained 15%+ grades at the end or sides. It's also where I headed for a recovery day walk as I could make it as challenging or as gentle as I needed. Rustic charm abounds in Vallunga. One can be fascinated for the the first few visits to Vallunga by the couple of old stone ruins on the rocky slopes or the various wooden crucifixes or the tiny little chapel in the meadow area. The little creek, the small wooden farmer's huts, the numerous rustic benches, and the delicate meadow flowers catch one's eye at the lower end of the valley before it narrows and rises and the larches and other conifers dominate the flora. The steep slopes, the red and yellow cliffs, and the many peaks are stunning and require at least a few visits to believe they are real and then to absorb. But for the frequent visitor to Vallunga, it is the ever-changing parade of people against the grand expanse of nature that makes the experience of it different each time. Young couples glowing with the joy of pushing their newborn-babe in a stroller are a common sight, as are families walking at their toddler's pace. Families in which every member is decked out in new boots, new socks, new pants, new sweaters, and new vests abound. 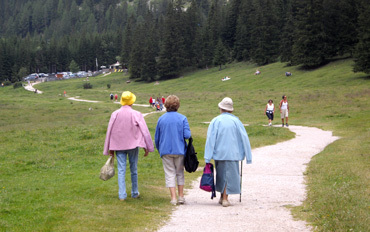 Some well-tanned older couples head out for their stroll in freshly-creased hiking pants and shirts. Elderly people of all ages meander along the white gravel path in 2's and 3's, pausing frequently to make a conversational point as Italians are fond of doing. And folks that are temporarily or permanently-mobility challenged can view the lower meadow spectacle from the hut-styled cafe at the parking lot's edge. The lower meadow of Vallunga is perfect for a stroll. There are cow pies on the gravel trail to dodge as well as the points of sharp new trekking poles being mindless whipped behind inexperienced hikers. In addition to these little hazards, it's best to stay alert for the rhythmic crunching sound made by the rare and otherwise-silent mountain biker that invades this stroller's paradise. Occasionally a loosely organized group of 20-30 children will stir-up enough dust on the path to warrant a strategic detour on to a side path. And a few, barely flying kites will add color to the low horizon on an especially busy day in the meadow. 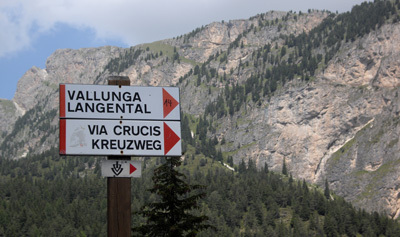 One quickly learns that the long valley's default language in this Ladin and German-speaking region of Italy is Italian--presumably because the majority of the Vallunga meadow visitors are from the Italian-speaking parts of Italy. English-speakers and others chatting away in a foreign language will quickly switch to "Buon giorno," "Ciao," or "Salve" to return a greeting to strangers on the path. Only a few mountain bikes venture into the long valley. Off the valley floor and on the steep trails heading to the peaks, German is the most often heard language among the hikers--presumably coming from Austrian and German tourists. But the voices that travel the farthest are those spoken into a cell phone in most any language. 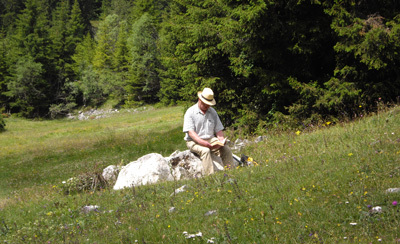 In the lower reaches of the valley, especially the meadow, there is almost always someone barely in earshot that is leaning into their cell phone. For some Vallunga visitors, the stroll involved in 'getting there' seems to be secondary. For them, getting there is a minor obstacle to overcome so that they can enjoy the natural setting for reading a book or a newspaper. And you never have to look far to spot yet another wild flower being captured in a photo, occasionally with the aid of a tripod. Reading is the culmination of the visit for some. When not looking at the show put on by my fellow visitors or the stunning display of nature in Vallunga, I turned my attention to my own body as I tromped its trails. The range of variations in the path surfaces, grades, and the people on it made it a wonderful time to revisit my posture and my walking style. Vallunga is a prized destination for young families. One day it was the posture and gait of a 30-something woman who looked so powerful and at ease that caught my eye--just where did that quality originate in her body? The many people staring at their feet with every step reminded me to lift my own drooping gaze to the horizon. The habitually glum expressions on the faces of so many fortified my smile. The steep bits of downhill in lose rock invited a bit of trail running which helped me find a different sense of equilibrium in my body. And the pound-pound-pounding of my feet that was amplified by the trail's varying grit and rock signaled that this jarring motion was just what my bones needed to be strong--the kind of stimulation that cycling doesn't give them. I'm one that is easily bored by repetition and in the past I remember being a bit bored with yet another walk in Vallunga. But this year was different, this year I managed to be fascinated with each of my visits to the long, tall valley. Tens of thousands turned out for Sella Ronda Bike Day. One week into our 2 week stay in Selva, we were drawn to get our exercise sitting rather than pounding the grit and rocks with our feet. It was the Sella Ronda Bike Day that had us dusting off our bikes for some prudent cross-training. This free, 4-passes Bike Day started in 2006 and we've participated in it several years. The total distance of the route is about 60 km or about 37 miles if you do all 4 passes and is about 2350 m or 7,700' elevation gain. The roads are closed to autos for about 7 hours for this biking extravaganza. As usual, we only rode 2 of the 4 passes, which was challenging enough. We would again ride the other 2 passes on loaded bikes at the end of our stay. Even though we only savored half of the Bike Day route, it was again a thrill to ride these familiar passes without our familiar loads and the sometimes nerve-racking traffic along the mountain terrain. We dutifully carried our rain gear for this year's Sella Ronda but escaped the day with only threatening sprinkles as we descended into Selva. The clouds did finally part this summer--something they apparently didn't do until we arrived in almost September last year--and we were able enjoy our main event, the Via Ferrata's. The first was a repeat of the neighborhood route out of nearby Vallunga, the Pertini route. Even though it was close by, it was a 7 hour outing. Its maximum elevation is relatively low, which made us feel less vulnerable if a big storm rolled in. Pertini is at the limit of our ability and the next day Bill discovered that one climbing group rates it as intermediate difficulty for Italian Via Ferratas. 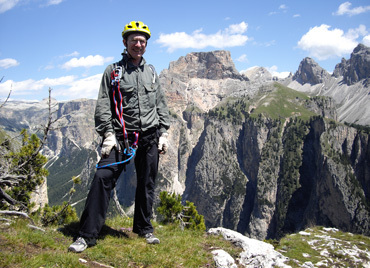 Arriving at the top of the Pertini Via Ferrata above Vallunga. The Pertini route was affirming of our new hiking and climbing accomplishments and yet it was a sobering reminder of our limitations. We started climbing Via Ferrata routes in 2006 and "Intermediate" is probably as good as we'll ever get. Despite pushing ourselves to move more quickly when attached to the cables and when only relying on our feet for safety, our speed and endurance limitations continue to put us at 'average'. Not bad for late-starters that usually only do about 4 Via Ferratas a year, and yet our lack of greater skill frustratingly continues to limit the number of routes available to us. Two-days later, after a necessary recovery day in Vallunga, we revisited a pair of easier Via Ferratas that begin at Passo Gardena. 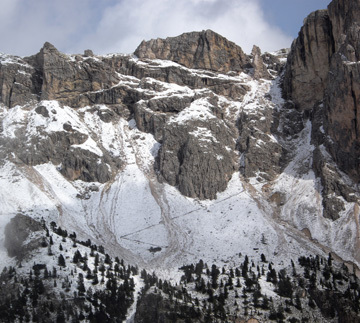 One of the 2 cable cars in Selva delivered us at the starting point of the route 200 meters or 660' above the pass. Luck wasn't with us on this day however as when we approached the highest point with the grandest views, the menacing fog that had engulfed us escalated into a brief storm. The fierce winds changed ordinary raindrops into vicious pelting devices and we had a stuttering response--stop vs go on; put on rain gear or wait a few minutes more--it was hard to decide. However the biggest worry was lightning, which wasn't included in the initial assault. 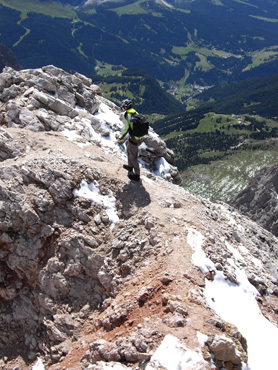 One Via Ferrata starts high above Passo Gardena. We decided to press-on with the route though skipped the short pitch to the tippy-top. No need to go there just for the glory as there was nothing visible in the dense clouds. While our clothes were still at the 'just damp enough for ironing' stage, the rain stopped and the fierce winds settled down. Bill heard the rubble of distant thunder which was obscured for me by my wind jacket hood. Should a nearby lightning storm have settled-in, we would have had no choice but to detach from the steel security cable to which we were hooked and hunker down until it passed. Though we'd lost the ease of the day and access to the best views, our luck turned with the changes in the fickle weather. There were no sightings of lightning, no additional rumbles of thunder, and the sun eventually reclaimed its former position overhead. We and others on this high ridge stopped at various little, mostly-flat spots to enjoy our packed lunches and the grand views. Not your typical July photo in the Northern Hemisphere. 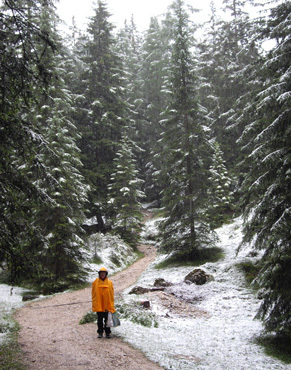 If the threat of daily thunderstorms hadn't challenged our cheery mood and plans enough, we then had to deal with snow. Disappointingly, our 2 week stay at Selva had ended with few new adventures added over previous year's. The threat of bad weather had kept us low and close to home, though we had a satisfying outing every day. 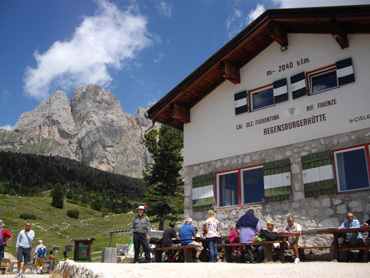 Bill's big event--a mountain hut or 'rifugio' stay--that was foiled last year was again on the schedule for this year as a finale and it was now in question. We'd made the arrangements to stash our bikes and extra gear with our Selva apartment's hostess and had reservations for 2 nights in a rifugio plus a night in the valley when we returned. But Saturday morning as we finished our packing, the several hours of torrential downpour turned to snow--amazingly, it was mid-July. It seemed foolish to press-on with our hut stay and hiking plans higher up the mountain but my biggest fret was spending the rest of the day damp and chilled in an unheated rifugio dorm room. But the thought of unraveling all of our plans and having Bill's big event be cancelled for a second year wasn't appealing either. We finally decided to stick to the program. We negotiated a 10:30 am check-out time from our apartment rather than the usual 9 am one to decrease the number of hours we'd potentially be shivering in the rifugio. Though we'd be lugging gear and food on our backs and in our arms, we decided to walk to the hut rather than take the usual bus-cable car combination up. That would get us our exercise for the day and burn-up more potential sitting-around time in the cool hut. Bill later confessed that he thought my idea of walking in the snow to the hut was wildly unappealing, but that was only revealed after his commitment to finding a way to enjoy it took hold. Early in the walk he commented "This reminds me of going Christmas tree cutting as a kid"--not the reaction one expects to hear in the middle of the summer. The extra load on the steep trails doubled the time required to get to the hut but it was enchanting to walk a route in the falling snow that we'd seen a few days prior on a sunny, warm day. We had 2 goals in going the the hut. One was to experience hut life for ourselves and to assess if we would want to plan a bigger hut-to-hut hiking route in the future. The immediate pay-off however was to access the Sass Rigais Via Ferrata route that was just out of reach for us from Selva. It was a long route and we'd have the pressure of getting down off the trails before the cable car closed unless we stayed in the mountain hut. The snow nicely highlighted another favorite trail. It stopped snowing just before we arrived at the hut and the day seemingly transformed itself in minutes. Previously reluctant Bill announced that he wanted to go for an additional walk after we checked-in. Luckily we were issued one of the few private rooms and it had a tiny electric heater; images of my worst case scenario of being cold, damp, and in a noisy dorm room melted faster than the snow. We shed our loads and our wet ponchos and went for a walk with snow under our feet and brilliant skies overhead. 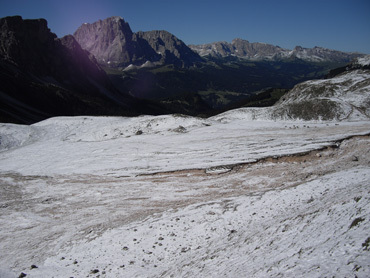 We still fretted a bit about whether the Via Ferrata route would be a 'go' the next morning. But it was a simple matter when we saw the clear morning skies to pack-up and hope it worked out. There was still snow on the ground but no apparent threat of a second storm. We launched ourselves hoping to do the long Via Ferrata route but would settle for a lovely walk in the high valley if the peaks weren't accessible. Looking back on the 1st hour's walk from the rifugio. It had been relatively easy to find our way for the first hour and then it became more difficult as we occasionally walked in the deep snow prints of the 4 people ahead of us for the second hour. Two hours after leaving the rifugio, we came to the rock face we'd seen the second couple struggle to pass by. We had slowly gained on them as they tried one strategy and then the next to find their way. As we too-precariously hung at the base of the problem area, we seriously considered turning back. It was feeling unsafe. There was ice instead of snow on the exposed rocks and the opportunities for tumbling a long way down had skyrocketed. But we'd done a lot to get ourselves there, so giving up quickly also didn't appeal. As we pondered our predicament and our options, 2 potential opportunities were presenting themselves. The first was the sun. We'd walked up the deep ravine in the cold shadow of the morning hoping to reach the area warmed by the sun. We'd become stalled out before escaping the long shadow, but while pausing, the sun had finally caught up with us. Whether we continued up or headed back down, waiting a while where we were made sense as letting the snow melt for 20 or 30 minutes would speed our passage in either direction. My habit of reading license plates when we cycle transfers into counting people when we hike and I'd been keeping track of the few people ahead and behind us. A solo hiker had been gaining on us and he'd be to where we were in minutes. Even as a dark silhouette against the snow, it was clear that he was one of those strong and experienced '2-legged mountain goats' that occasionally pass us by. He suddenly went from being just enviable to being an asset. All smiles....once we were out of the snow. His hesitations as he searched for the best route below us suggested that he also didn't know the way but his prowess also indicated that it wasn't slowing him down much, so we waited on our perch. He arrived to where we were, to where we had balked, and he choose to proceed along our untested Plan B. We were concerned that the Plan B ledge might have loose rock under the snow that would give way when stepped upon, but he confidently headed onto it. It held nicely as the snow compacted under his feet and we gave a silent "Thanks" to our unpaid guide. Suddenly our event was back on and we followed his snow prints up into the sunny areas until there was too little snow to track him. Fortunately we were then able to find enough of the trail markers to locate the Via Ferrata steel cable. The snowy approach had cost us time and energy. 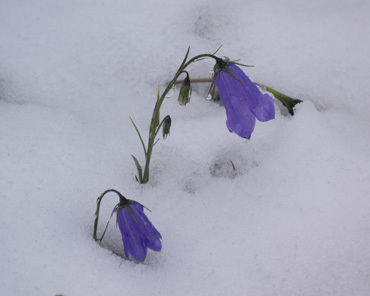 Finding our way and walking in the deep snow were unexpected challenges. But life got easier on what should have been the hard part--the Via Ferrata itself. Stronger hikers who had started later in the morning and battled less snow began catching up with us and there was the familiar feeling of being a little crowded on the wire. That actually was a nice change from the 'out in the snow alone' feeling, though we hadn't been entirely alone. The biggest surprise of the day was waiting for us at the almost 10,000' top. 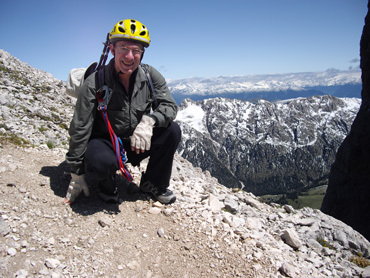 Bill's Via Ferrata book described the summit as being "a bit airy" which in my book would be written instead as "foolishly dangerous." As is sometimes the case on these Via Ferrata routes, we got to what looked like one of the most treacherous places in the course and found ourselves saying "Where's the wire?" Narrow little paths on the peak with endless drop-offs on either side triggered fear in me that I hadn't felt before. "Why did they do this to us?" was all we could think. But we like everyone else, including the family with 2 pre-teens, rallied and made our way past the 'narrows' to find ourselves on a very challenging descent--with a wire. The exposed top of Sasso Rigais. Days later when we were descending down a big scree field from another Via Ferrata, I thought of that "airy" peak on Sass Rigais. We had managed to make that short, dangerous summit traverse safely, but "What if it had been windy?" had been blaring in my mind at the time. On this later less dangerous hike, the winds had become so strong in the early afternoon that more than once I hunkered down so as not to be blown over. I kept wondering how the people on that terrifying Sass Rigais peak were managing on this day of strong gusts as they faced that dangerous traverse. Needless to say, we won't be doing Sass Rigais again. Like on our arrival day at the rifugio, the next morning we had an awkward amount of time on our hands. "Early out the door" was the rule at the hut but we couldn't check-in to our Selva B&B until afternoon. 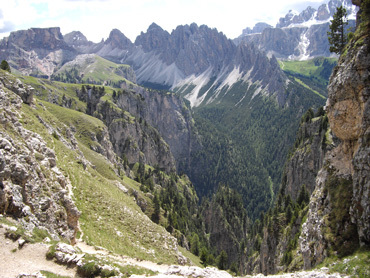 We decided to walk part way back to the Via Ferrata route before walking the 1500' descent to Selva to burn-up the time and take in the views. I was absolutely aghast when we arrived at the point where we'd turned up the deep, narrow gorge in the snow the day before--the point at which we'd followed the foot prints of others to find our way. I didn't recognize the gorge at all and was horrified to see just how huge the boulders were in that rock debris cluttered valley floor. I couldn't imagine how anyone had found a route through without the aid of trail markers. We could also clearly see that what had been the best route for the snow day wasn't anywhere close to the posted route. We didn't continue up this gorge to the next giant terrace to inspect the spot at which we had balked but instead explored new territory in the warmer, sun-exposed next side valley. Heading to Selva from our rifugio stay. Once back in Selva we realized just how deeply tired we were. We'd been exhausted when we dragged in the previous night after doing the long Via Ferrata route. That second night in the rifugio, even our fingers and toes ached from all the difficult rock climbing. And in hindsight we could feel that we'd put on too many miles on this our 'relative rest' day when we'd walked up to the base of the Via Ferrata gorge and then down to Selva. 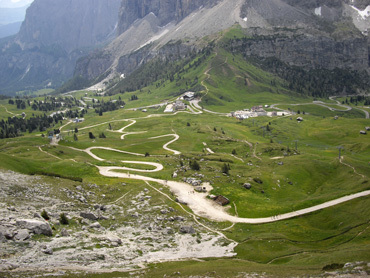 I knew that the next morning when we departed Selva would be a wobbly affair on loaded bikes after a 16-day break, a ride that would take us over a steep pass to Corvara. I was a bit nervous that night and the next morning--nervous that I wouldn't have the strength to do it comfortably--but the need to consolidate and repack all of our gear kept my mind off of the self-doubt. It was time to wrap-up our stay in Selva for the second time this year and to look forward to a week in the next valley, Alta Badia, and the village of Corvara. We crossed the border from Italy into Austria at the 8,200' pass Timmelsjoch 2 days ago and have parked ourselves in a small ski resort village of Obergurgl in the general vicinity of Innsbruck. An inexpensive, cheery ski apartment has us deciding to extend our 5 day stay to 7 to take in a bit more hiking in the area. Bill is still at the "too many choices" stage of route planning, so we don't yet know where we will be going from here. 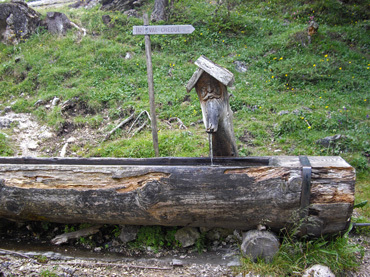 Extending our stay will in Obergurgl will also allow more time for developing our itinerary.